The UAlbany SBDC has assisted tens of thousands of small business clients, some who can be identified as serial entrepreneurs. Kevin Shufelt is one of those. Kevin initially worked with the Center with his first business in 1993 and has recently returned with another startup. Kevin’s first business was a fast food take-out restaurant that focused on healthy eating. The endeavor did not launch at that time, but will likely open in 2018. Kevin returned to the UAlbany SBDC in 1996 seeking assistance in opening a floating barge restaurant and bar named the Riverfront Barge, which was docked on the Hudson River alongside downtown Albany. The success of that venture brought him back to the Center again in 2003 for assistance in preparing a business plan for his second floating barge restaurant to be located in Watervliet, the Rusty Anchor Barge. Both floating restaurants continue to be successful waterfront attractions. In 2014, Kevin consulted the UAlbany SBDC for assistance with a disaster assistance application to the NY Rising Program that ultimately helped him obtain more than $70,000 dollars for damages done to the Rusty Anchor Barge due to the flooding from Hurricane Irene in 2011. While the business reopened the season after the hurricane, the loss of business and repairs put a serious strain on all of his business operations. The NY Rising grant assistance helped Kevin get back into entrepreneurial mode with his fourth venture. 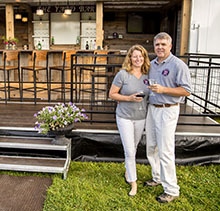 The Yard Bar will be a mobile full-service bar/trailer that Kevin will market to event planners and caterers. While the business is still in its infancy, it no doubt will grow quickly based on Kevin’s track record of success.